With the Adult BLT Costume,you'll be the most deliciously cute couple at the party! 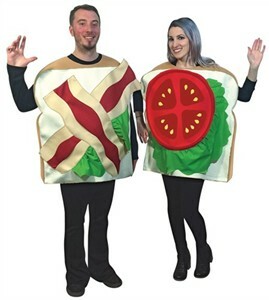 If you and your partner could go for a good BLT sandwich and enjoy doing things together, then this BLT 2 person costume is the perfect idea for you. Show your partner that you're not complete without the other just like one half of a BLT sandwich is not complete without the other half. Complete each other by dressing up in this BLT couples costume. This product comes with two BLT tunics. When you and your partner wear these Bacon, Lettuce and Tomato costume suits, you'll just want to eat each other up! Availability: The Adult BLT Couples Costume ships in approximately 1-2 business days.